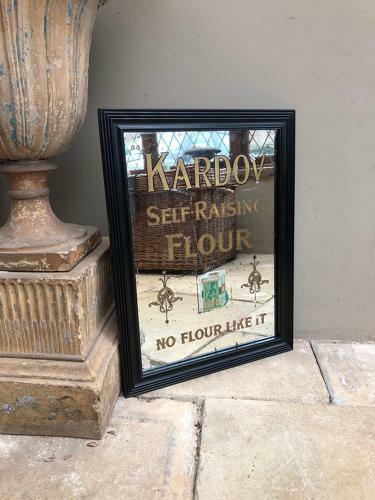 Rare Edwardian Shops Advertising Mirror for KARDOV SELF RAISING FLOUR NO FLOUR LIKE IT. First one I have ever seen. A handy size to use. Useable foxing and very small areas of loss to the reverse paint, behind the areas of loss foil has been placed which does the job well and all reframed in a black reeded period style frame.